Select from a list of all defined switches, turntables, fiddle yards, signals and outputs the ID you want to use to activate this route. 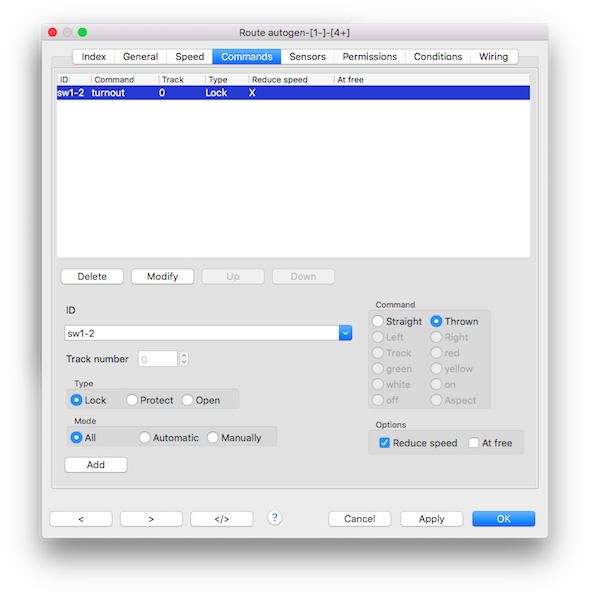 In case you selected a turntable or Fiddleyard you can set here the turntable track number. This field is also used to set the aspect number for signals using the aspect command. A turntable will turn 180° if track number is set to 180. Only the commands available for the currently selected object are activated. 1) The passive Center Crossing in a route is used for flank protection only. The selected command has no effect. Only uncheck this if the switch is set for safety and does not belong to this route! In all other cases it should be checked to avoid collisions. The lock should only be disabled, if the switch is to be made for safety (flank protection) and is not to be used by the train! In all other cases, the locks should be activated to prevent collisions. Tip: A route-locked switch cannot be adjusted manually, this is a safety feature of Rocview. This lock can be released by right-clicking on the turnout while pressing the Ctrl key and select the desired command. This is useful if the switch has not switched in the correct position and the command has to be repeated manually. If the switch does not belong to the route but must provide flank protection for it. Just set the switch if possible, if its not possible the route will ignore it. The command will be executed in both automatic and manually mode. This is default and is preferred. The command will be executed in automatic mode only. The command will be executed in manually mode only. The route will check if this switch needs reduced train speed if not set to straight. If the selected command should be activated at free, unlock, this option must be activated. Especially useful for signals that have been switched by a route command and should be set back when the route is cleared. Select the wanted Object ID from the combobox, set the desired command action and push Add. For single motor switches you can only select Straight or Turnout. In case of 2 motor types the Left and Right commands will be enabled. Select an object in the listbox and push the Delete button. Select an object in the listbox, change the command and push the Modify button. Move a command up or down in the list to change the sequence. The listed commands are executed from top to bottom of the list. It is advisable to move signal commands to the end of the list so that they are executed after the switches have been set.